What’s Behind Our Dreams & Goals? We’ve wrapped up our second week of school! This week we had my dear friend Mariusz & and his wife Maya come visit from Poland. Mariusz started his own preschool in Poland, Zielona Wieza, currently serving between 50-60 children ages 2-6. He is now planning to open a school for the graduates of Zielona Wieza and has been doing quite a bit of research over the past few years to get ready. He’s visited many democratic schools, including one of the oldest – Summerhill. It was really great to have Mariusz attend our week one ALF summer program and then come back to see our Agile Learning Center in action. The kids loved having them visit and @libby tried to learn some Polish words and phrases from Mariusz as well. I love having the kids exposed to many different cultures and types of people! This week we had many exciting things happen: we got our school pet, Buns the bunny; the band Fish Out of Water came to lead us in a drum circle, perform, and then try out their instruments; some went on an Uptown adventure to Romare Bearden Park to meet Roots, ping pong continued to be a huge hit; our Minecraft/Terraria gaming culture blossomed with teamwork, collaboration, and joyful play; we started our InterALC Psychology Crash Course with @cammysherbert in Wilmington; and so much more. Please visit our September album on Facebook to see pictures! Review: Why Do We Spawn? The focus of this blog post, like last week, is to dive into and record what we’ve been up to in our Spawn Point. Our Spawn Point at the beginning and the end of the day are our times to coach, mentor, and connect with the students. 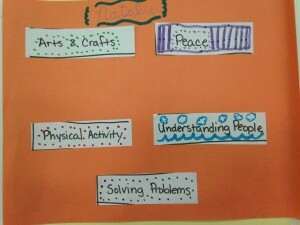 It’s also a really important time for the kids to connect with each other and hear the interests, goals, and intentions that other students have. I believe that carving out this time together is crucial to create positive culture in school. While we do our best honor the individual needs and differences of each person, the fact that remains is that if you are choosing to come to our ALC, you are choosing to “live” with a community of other people for a portion of the day. This means that time spent to know each other has to happen so we can learn how to navigate the day in harmony despite our many differences. Learning about each other will help us act more compassionately toward one another and allow us to see situations from perspectives outside of our own. So the buy-in to attend ALC Mosaic is that we take time each day to connect as a group. Meeting whole school each morning would be counter productive, however. We have too many students to do this. Trying to hear each other with respect and honor with 25+ people in one room would lead to frustration and probably have more of a negative impact on our culture than positive. So at our ALC, we split into two Spawn Points to start and end each day. 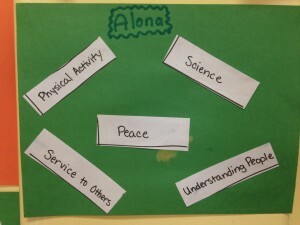 Each group was chosen by the Lead Facilitators at the school to create balance groups that have mixed gender and age groups. We spend the first 30 minutes of our day in our respective Spawn Points. At 3pm the kids clean up and then go to an end of the day Spawn Point which ends up being about 10-20 minutes depending on when we finish our clean up jobs. One interesting observation Mariusz shared with our staff after attending our older campus for three days was that the kids here seemed really connected and able to work out their needs and problems with each other through communication. He felt that there was less conflict here than in the other democratic schools he’s attended and that perhaps that was because the kids had such a strong bond to each other. I agree with him that our students are really connected. What’s interesting is, that at times, their deep connection can actually lead to conflict at school when they act as if they were all brothers and sisters (think about how siblings bicker)! However, the kids ultimately seem to really love and support each other and we can work out most conflicts through communication. This year there has been a lot of intentionality on the part of the Lead Facilitators to cultivate peaceful and connective Spawn Points to start and end our days, which I do see reflecting in the general flow & feel of the rest of the day from 10-3. This Week’s Spawn Point Focus: What’s Behind Our Goals & Dreams? Last week my blog post contained a detailed breakdown of what happened in my Spawn Point each day. At the beginning of this week, I thought that we might dive deeper into our goals, perhaps even breaking those goals down into SMART goals with more specific, measurable, and time-constrained steps. However, as we got into the week, I felt that this wasn’t the place to go. I did have a breakout goal setting work session with two students, but I didn’t feel that Spawn was the place for this right now. Instead, I felt it important that we dissect what was behind our dreams. The most important thing I believe an adult in an ALC can do is to model knowing oneself truly. This means connecting to who we truly are and using our inner guidance and intuition to guide our actions with intention. This is how we can support the kids to do the same. One of the reasons I felt guided to not dive into deeper goal setting this week is because I realized that doing so was missing the most important piece: Who are we and why do we have the the dreams we have? 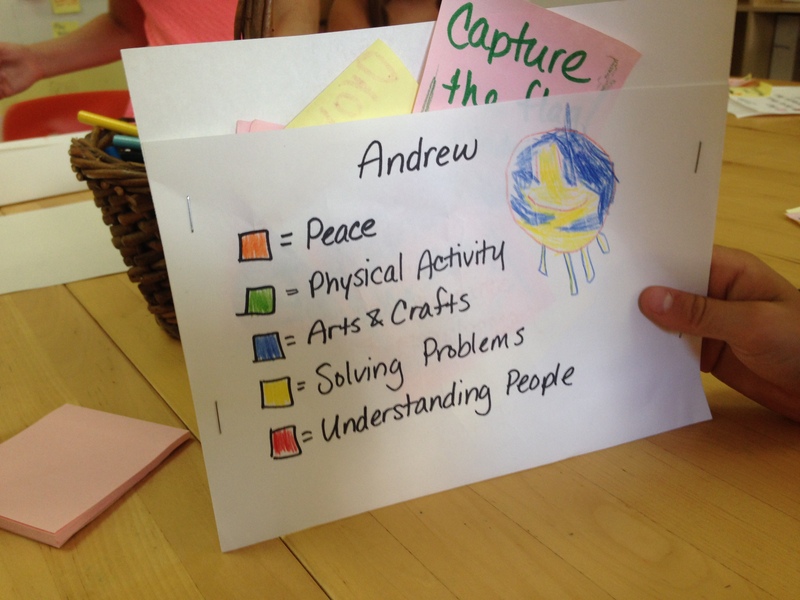 To just jump into goal-setting setting is just an outcome based approached, an approach that is typically found in schools to make adults feel better: Oh look at those kids doing so much! Isn’t that just wonderful! They are busy and look at the outcome of all they have produced! But the work of the kids learning to listen to their inner guidance and intuition has been overlooked and disregarded – instead, they are just busy doing things that make us feel better. We don’t do that here! 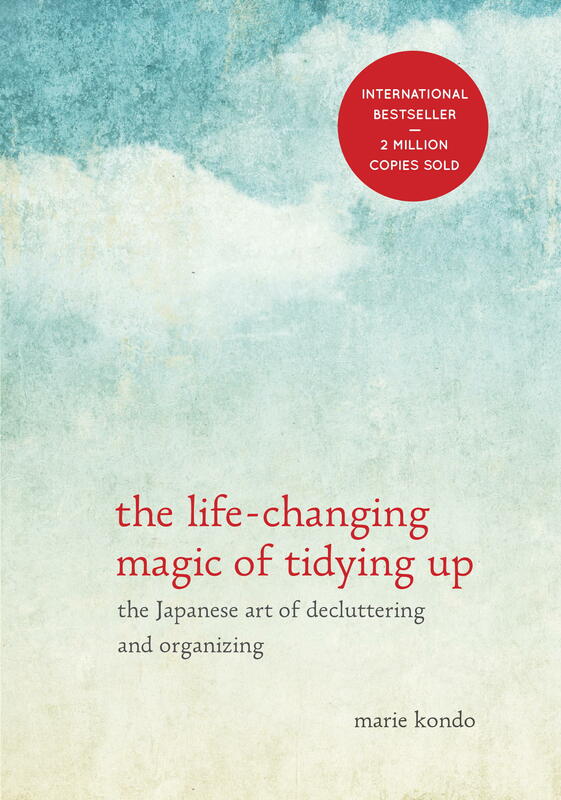 I am reading a book this week that has become pretty popular lately: The Life-Changing Magic of Tidying Up: The Japanese Art of Decluttering and Organizing by Marie Kondo. This book was a part of my inspiration to try to support the kids in Spawn Point this week to focus on who they are rather than what they want to produce. Kondo’s approach is different than any other tidying method I’ve come across: rather than focus on rules, like “If you haven’t worn it in a year, donate it,” Kondo focuses on first examining why you want to tidy up your home and asks you dig into that question. She suggests asking yourself “Why?” at least three times so you can get a specific answer to how you want to feel in and experience your home. Her process is mostly focused on teaching you to know yourself and listen to your intuition of whether or not an item sparks joy in your heart. All things that don’t, you get rid of. According to Kondo, “Follow your intuition and all will be well.” Her point is that if you follow someone else’s guidance for how to tidy up your home, you’ll rebound because the criteria set most likely will not match what you need to have in your life to experience joy. She writes, “only you can know what kind of environment makes you feel happy…To avoid rebound, you need to create your own tidying method with your own standards” (page 126). Reading her book, I felt alive with joy at how she applied something I believe to be the most important skill a human can learn to tidying up: How to listen to our intuition (or inner guidance as I sometimes refer to it). To Kondo, when you hone this skill you can create magic in your home. I believe honing this skill will lead to joy and magic to your life as a whole. Teaching kids to create their own standards for what they need in their life is the starting point for them to create and build their own lives. Telling them our standards to live by is not the same as supporting them to discover their own. I told the kids that if we examine the “Why?” behind our goals and dreams, than it can help us stick with challenges or obstacles that come up if following their dream or completing their goal gets tough. If you aren’t connected to your personal motivation for completing a goal, it’s easy to just stop and not complete it. This is why it is so important to not just give kids busy work and then chastise them when they are “lazy” or don’t complete it. The lesson for the child in that situation is that they are lazy. But if person hasn’t had the opportunity or coaching to understand who they are and what inspires them, then they might not have the opportunity to learn that they are actually a motivated and driven person. 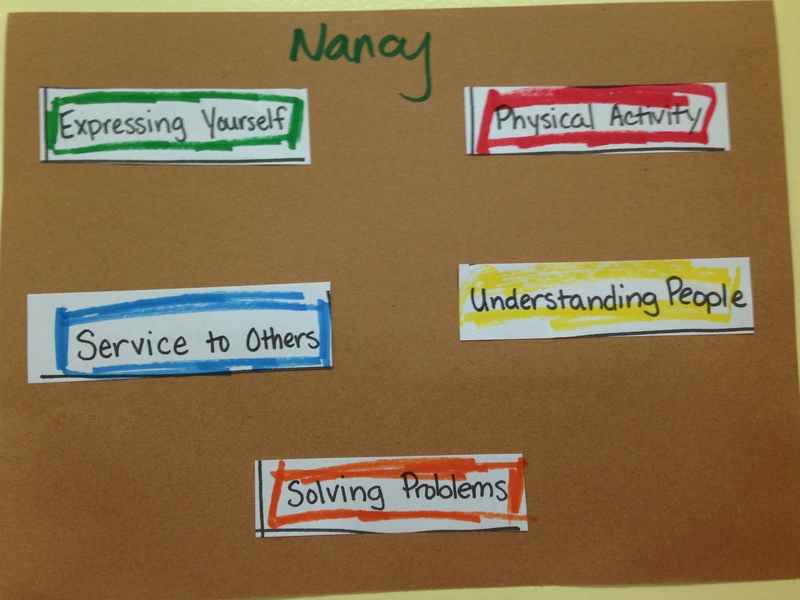 The kids seemed to have fun with this buddy activity and I hope to repeat it for the next couple Mondays. I also think it helps build connection and support – with the buddy learning more about the other person as you learn about yourself. 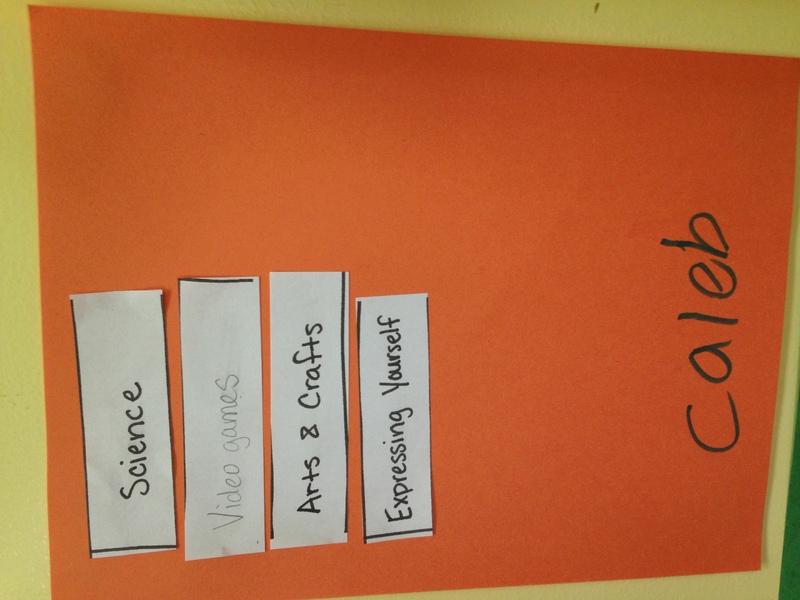 I built on this concept by then asking the kids to do a little experiment with me for a week. 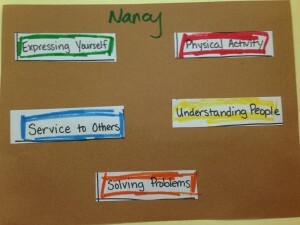 I was reading some goal setting literature I was given over our ALF Summer Program by @drew’s mom, Lorna. Part of the process was to identify your core values in order to get to a place where you’re ready to set goals. 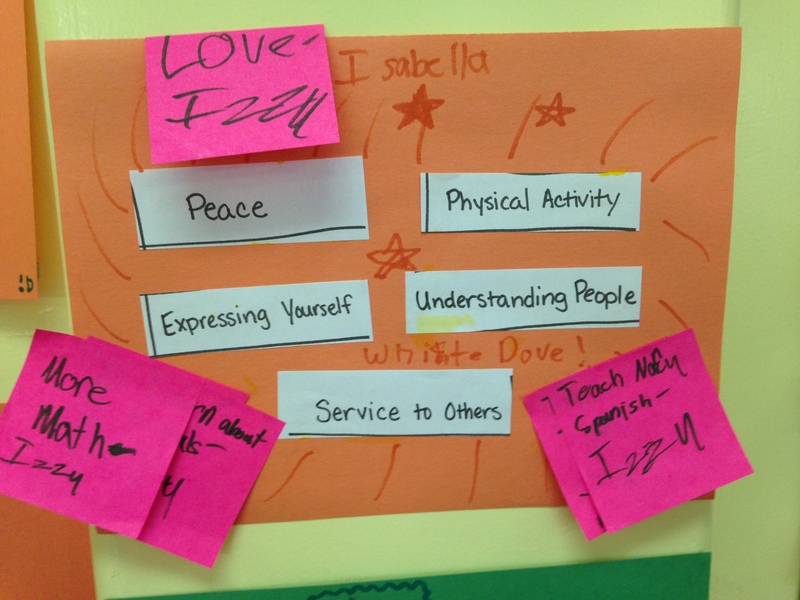 This felt really aligned with the “Why” activity – know yourself before jumping into setting goals. As I looked over the list on the adult handout, I had an idea. 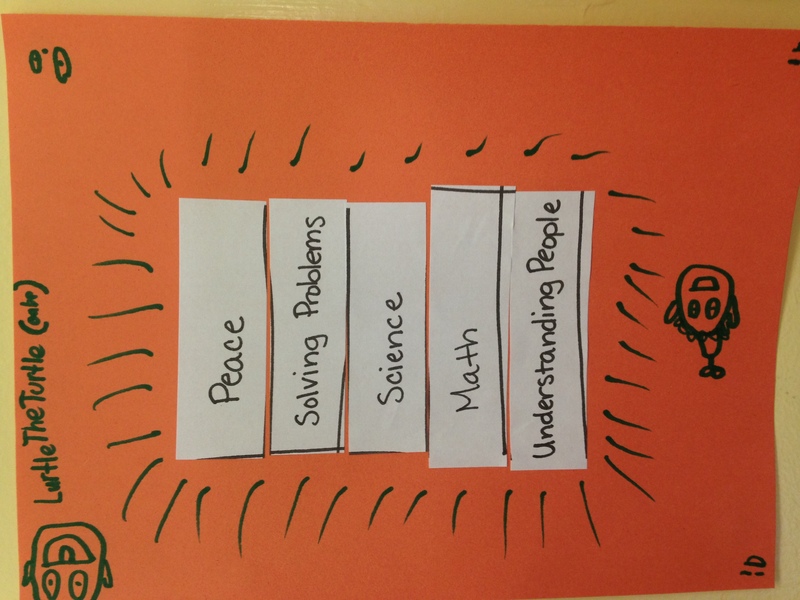 I would write some values down on slips of paper and ask the kids to identify their top 5 core values. As I looked at the values on the sheet, I realized that not all of those listed would make sense to younger children (the ages in my Spawn range from 7-12), so I added some simpler categories that might just cover types of activities kids enjoy, like math and science. 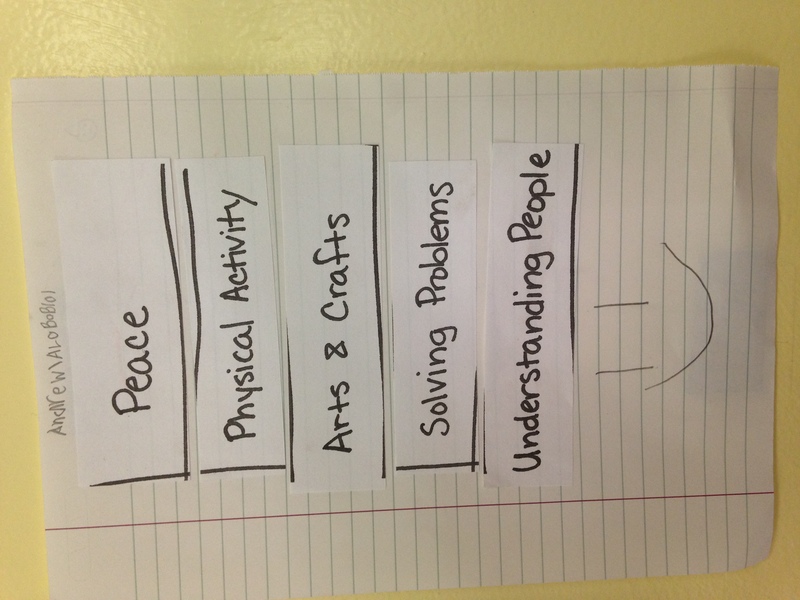 I also left slips blank so kids could write in their own values or categories for how to spend their time. The slips had words like Peace, Making Things, Service to Others, Understanding People, Community Building, Science, Math, Physical Activity, Solving Problems and a few more. Note: Again, as I wrote last week, I don’t force the kids to do this. A couple didn’t want to do it, and that’s totally okay. Some people really want to see how something goes before they try it themselves. Some simply learn by watching and absorbing. Some kids really, really like activities such as these and find it exciting and fun, while others go along with it just because. The most interesting cases are those that always refuse in the beginning and then ask to do the activity a different day. This happened with one of the students who said no the first day, but then asked me if they could chose their words the next. 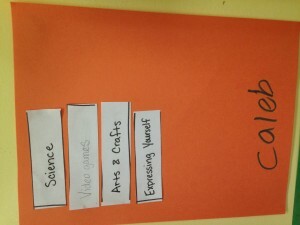 The next day, I prepared envelopes for each of the kids with the values/ways to spend their time they selected with boxes. They color coded the boxes and the experiment we are currently embarking on is one where they color code the ways they actually spend their time to see how it aligns with the selections they said are important to them. At the end of the day, they take their intention sticky notes from the morning and color on them to match the category it fits in, if it fits in one at all. 1) Making decisions: Are you making decisions that are aligned with values or interests that are important to you? 2) Articulation: I find that kids in our schools are told by kids in traditional schools that they aren’t learning anything. 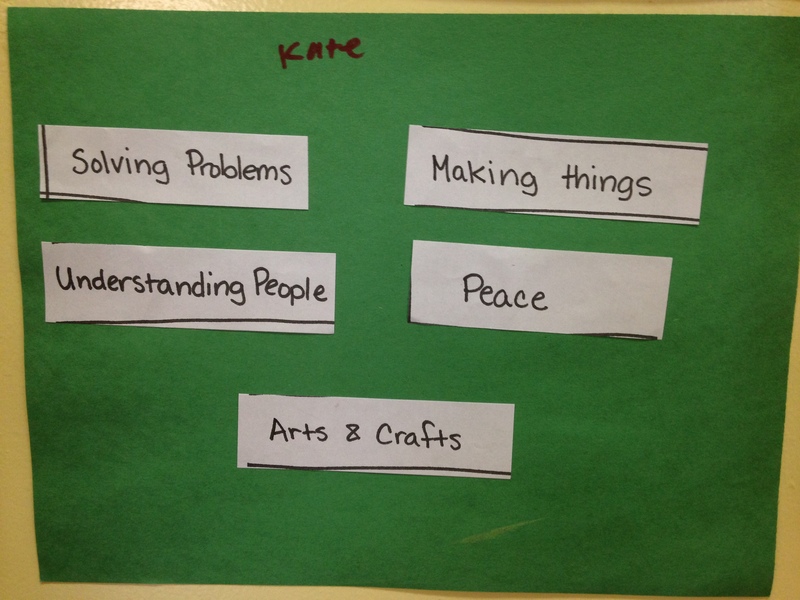 I think it is important for a school setting such as ours (with pedagogical ties to free schools/unschooling) to help kids build their vocabulary for how they describe what they learn at school. Can we support them to say to the neighborhood kids, “Oh, at my school I learn how to make decisions that reflect my values, passions, and interests. 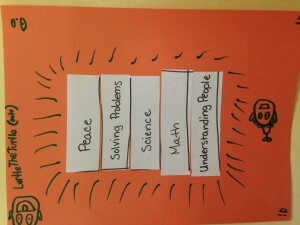 I value peace so I help others solve conflicts or problems. 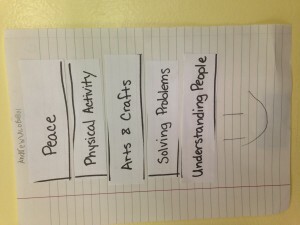 I also really think physical activity is important to me so I organize an active game with my friends every day.” My heart hurts some when I hear stories of neighborhood kids telling kids at our school that they just play all day and don’t learn anything (which is impossible – we are always learning!). Play is how we learn, and through play we can explore our values. 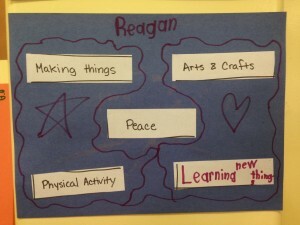 The trick is to support our kids to articulate that so they can feel confident and great about what they experience and create for themselves each day at an Agile Learning Center. 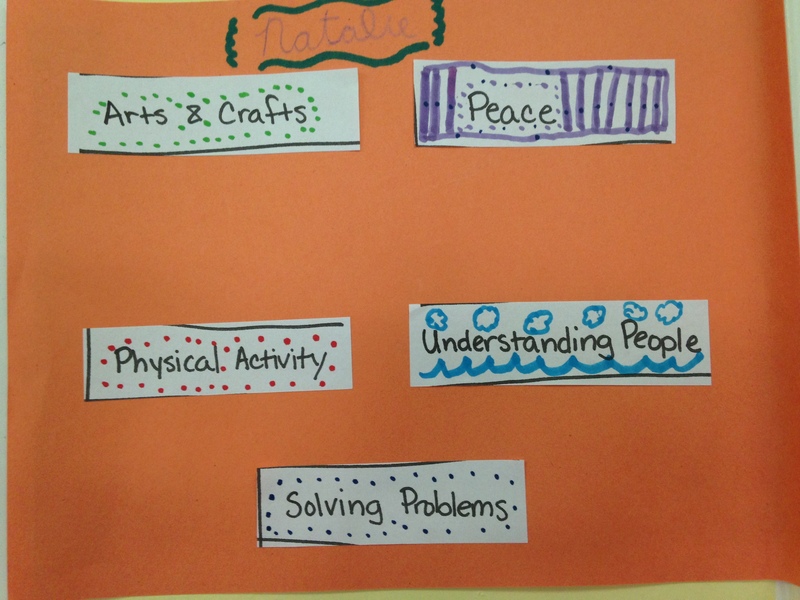 I enjoy hearing at the end of the day how the kids sort their activities. One child said when they play ping-pong it brings a feeling of peace to them as they hear the “ping-pong” of the ball back and forth. Another child said when they play ping-pong it helps them understand people because she has to think about what the other person is going to do when she plays opposite them. 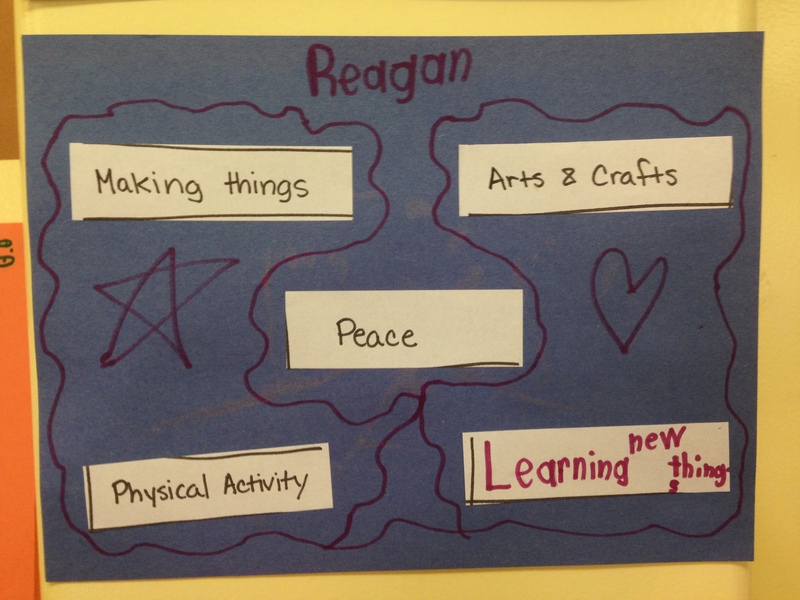 I am seeing that this just adds a deeper layer to the end of the day reflection and I’m getting to know the kids more. I am also doing this with the kids each day too and am personally enjoying that experience as well!